Do I need a vent for extending a drain to a new bathroom addition? I am building a new full bathroom on what used to be my back porch. 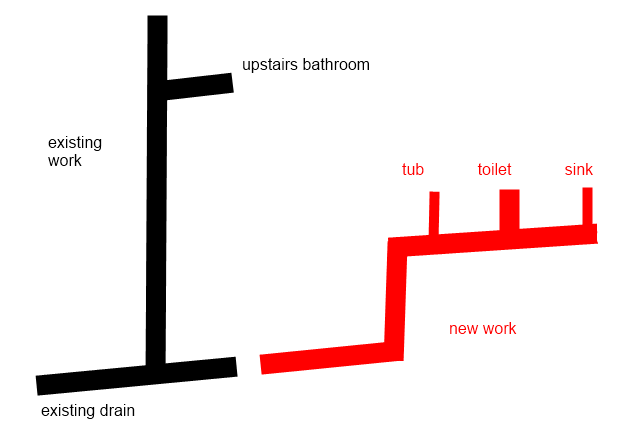 I am planning to extend the existing drain at a cleanout and to run it outside the house underneath the floor. I need to know if I need to add a new vent to the extension, or if I can rely on the existing vent. The total length of the new (4") drain will be about 15' from the existing vent to the farthest fixture. I am in Virginia. I've looked at the code but I can't figure out which rules apply to my situation. You must have a vent above the vertical run for these drains. As drawn, water from your new work cannot draw air behind it from your existing work. This is what vents do: draw air in behind draining water. You could functionally combine all the new work drains as drawn into a single vertical vent, but remember that it needs to be able to draw air from above their combined drain line. Depending on your code you may or may not be able to combine these into a single vent, but they will need their own vent. I would like to clarify a few things regarding this question and the provided answers. As others have stated, you will definitely need to provide additional venting for the fixtures within this new addition, the existing vent will not suffice. Others have recommended providing individual vents for each fixture and then combining them in the ceiling to one common vent. While there is nothing wrong with this solution, it is inefficient and would be more costly. SECTION 909 WET VENTING 909.1 Horizontal wet vent permitted. Any combination of fixtures within two bathroom groups located on the same floor level is permitted to be vented by a horizontal wet vent. The wet vent shall be considered the vent for the fixtures and shall extend from the connection of the dry vent along the direction of the flow in the drain pipe to the most downstream fixture drain connection horizontal branch drain. Only the fixtures within the bathroom groups shall connect to the wet-vented horizontal branch drain. Any additional fixtures shall discharge downstream of the horizontal wet vent. In Canada, one of the rules to wet venting is that the water closet must be the last fixture connected to a wet vent, that is no other fixtures are allowed to be connected downstream of the water closet. This reason is that when the water closet is flushed it could "choke off" the wet vent of any downstream connections. I did not see any requirement for this in your code, however all of the sample drawings provided in Appendix N showed the water closet as the last fixture with the exception of Figure N4: B. Horizontal Wet Venting (page 4) which shows a shower connected downstream of the water closet. The one on the left shows the tub connected downstream of the water closet. The drawing on the right shows the water closet as the last fixture connected to the wet vent (this is how we would do it in Canada). In both drawings, the red line represents the portion of the system which would be considered the wet vent. The dashed line represents the dry vent. As you can see, wet venting eliminates a lot of the vertical piping and saves on fittings as well. Please note that you should have a clean-out installed on the vertical section of pipe before the lav's fixture arm (located in the wall). This will allow for cleaning of the branch line. You're very close to the thresholds for a vent based on distance. But as ppd explains, you cannot rely on the existing stack as your vent. One option, as others have suggested, is to individually vent each drain where it goes vertical in the wall, connect these vents in the ceiling, and tie that into the vent stack. Make sure you maintain a positive slope on the vent line. See pdd's post for a way to vent off the lavatory because of the vertical fall restriction, and a wet vent for the remaining drains. 906.2 Venting of fixture drains. 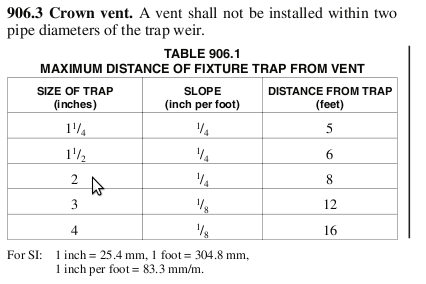 The total fall in a fixture drain due to pipe slope shall not exceed the diameter of the fixture drain, nor shall the vent connection to a fixture drain, except for water closets, be below the weir of the trap. The best way to go is for each fixture to have its own trap and vent, and add some cleanouts at the important junctions (keep the one at the wall, if you can access it). I'd say you should definitely not try to just rely on the vent(s) of the existing bathroom. Not the answer you're looking for? Browse other questions tagged plumbing drain drain-waste-vent or ask your own question. Why do I have a vent stack if none of my fixtures are vented? Do I need to add a vent when moving a toilet drain across the bathroom? What's the minimum vent diameter required for my drain line? Could our new plumbing be to blame for our new downstairs toilet and upstairs spare bath being clogged? Is my design for this drain-waste-vent system acceptable?